Jean Piaget research papers chronicle the work of the psychologist and discuss his famous work The Psychology of the Child. Psychology classes study Jean Piaget and his theory of cognitive development. Piaget's theory is also used for educational majors and in child development courses. 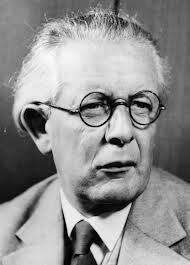 If you have a research paper due on Jean Piaget and need his life or his theories explained, have Paper Masters custom write it for you. Jean Piaget developed the theory of cognitive development in opposition to how human growth was viewed at the time. The general view of children was that they were little versions of adults. Piaget begged to differ, and devised his theory which contends that children’s thought processes are qualitatively different than adults’. The theory of cognitive development is based on stages. A child grows from stage to stage through schemas, whereby he or she adapts to experience, assimilates that experience, and accommodates the change in perception. The first stage of cognitive development is sensorimotor (0-2 years). Intelligence is based in motor activity. The second is pre-operational (3-7 years). Intelligence in this stage is intuitive in nature. The third is concrete operations (8-11 years). This form of intelligence is logical, but dependent on concrete references. Finally, a child reaches formal operations (12-15 years). Intelligence has reached the level where a child can think abstractly. This is a broad overview of the theory, but in fact, each stage has many detailed structural forms to account for individual differences in children. For example, the concrete operational stage has more than 40 distinct structures. In Piaget’s book, The Psychology of the Child, Piaget also suggests that this cognitive development in children in of a biological nature. This suggests that cognitive development will naturally unfold in children without any intervention from parents or educators. In other words, there is little that anyone can do with regard to encouraging or rushing this development. Thus, children cannot learn skills that are inappropriate for their cognitive level. They cannot be prevented from developing these skills by restricting their environment. In fact, one’s environment has little to do with this development process. Piaget’s Cognitive Theory of Development included four distinct categories of human development. Sensori-Motor, the first stage, involved infants and their use of the five senses to comprehend their surrounding world. Children of this age are unable to use language to communicate and lack the ability to recall objects or people once they have left the infant’s field of view. In addition, infants in the sensori-motor stage lack consciousness of self and exist in alternating states of tension and relaxation. As language capabilities are acquired, infants grow and pass into the next stage, Preoperational. This stage involves children of preschool and kindergarten age, approximately two to six years old. Although children of these ages are becoming proficient in using language to communicate orally, they are not capable of recognizing other people’s perceptions. Therefore, they are self-centered. The third stage is the Concrete Operational stage and involves the development of logical thinking. Operations of children in this stage primarily involve tangible objects that can be manipulated rather than abstract thoughts. Their current level of cognitive structure permits only step-by-step reasoning skills. Finally, by ages 11 or 12, children enter the final stage, Formal Operational. This stage is characterized by the ability to think abstractly and utilize the skills of synthesis and integration to understand the world around them. In addition, children in this stage can understand ideals and moral values. Piaget Theories - Jean Piaget was a Swiss psychologist instrumental in the creation of theories regarding the development of children. Origins of Intelligence in Children - Origins of Intelligence in Children research papers evaluate the work by Jean Piaget on Cognitive Development. Cognitive and Psychosocial Development Case Study - Though Wayland has been diagnosed with reading disabilities, he appears on- track with regard to general cognitive development. Piaget vs Vygotsky - Jean Piaget (1896-1980) and Lev Vygotsky (1896-1934) both made major contributions to the field of education. Lawrence Kohlberg - Lawrence Kohlberg Research Papers discuss Kohlberg's theory on moral development. Piaget Assimilation - Paper Masters can show you how to write a research paper on Jean Piaget's theory on assimilation. Stages of Intellectual Development - Stages of Intellectual Development research papers discuss Jean Piaget's theories of cognitive development. Creative Learning - Creative Learning research papers look at how theorists seek to define the elusive nature of human creativity and its impact on education. Constructivist Learning Theory - The notion of constructivism as a learning theory was pioneered by Jean Piaget, one of the most profound educational theorists in our history. Intellectual Growth - Intellectual Growth research papers look at the four stages of intellectual growth in the human lifespan. Cognitive Learning Theory - Theorist Jean Piaget was instrumental in developing cognitive learning theory, demonstrating that children think in very different ways from adults. Childhood Development - Childhood Development research papers overview the process of childhood development, which encompasses the physical, mental, and emotional growth that occurs from birth through the end of adolescence. Cognitive Theory - Cognitive Theory Research Paper provides an understanding process of human education. Developmental Stages - Developmental Stages Research Papers discuss an example of an order placed for a graduate paper and specifies characteristics that must be examined in the project. Knowledge Construction - Knowledge construction has emerged out of the Constructivist school of theory, developed by John Dewey, Jean Piaget and others. Paper Masters writes custom research papers on Jean Piaget and chronicle the work of the psychologist and discuss his famous work The Psychology of the Child.